Wounds range in size from 1" x 1.25" to 4" x 2"
Oh no! Buddy, what happened? We totally thought you would make it. You seemed so wily. You knew to take your time, hiding out until the hordes went past. Do you make the classic mistake of not bringing your weapon into the bathroom? Or maybe you got trapped and told everyone to go on without you well you held the hordes back. Wow, good for you. What a hero! Well, we respect you and feel for you but there's no way we're going to get close to you anymore. Make your 'walker' costume the best with some super realistic rot effects! The zombies on The Walking Dead have been roaming around for quite a while, so you're going to have to take extra steps if you want to look like a member of the cast. This FX Transfers are makeup quality graphics, with the ease of a temporary tattoo. You'll get four easy-on tats with a realistic look. 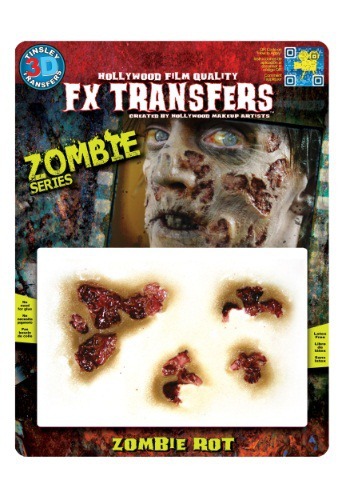 Add this to your zombie makeup supply, and you're sure to have an un-dead look that everyone will be dying for!